In her life­time, Fan­ny Cros­by was one of the best known wo­men in the Unit­ed States. To this day, the vast ma­jor­i­ty of Amer­i­can hymn­als con­tain her work. On March 24, 1820, in a little country home in Putnam County, New York, John and Marcy Crosby were blessed with their third daughter, Frances Jane. Marcy was only 20 years old at the time Frances was born. This was a strong, loving family with deep Puritan roots. The great-grandfather of this little girl, who was better known as “Fanny,” had fought in the Revolution. So also had another relative of hers, Enoch Crosby, who would later become one of the heroes in the classic novels of James Fenimore Cooper. Some of Fanny’s more distant relatives were noted scholastics who had helped to found Harvard College. As one author noted, Fanny Crosby was of “sturdy New England stock.” A true colonial thoroughbred! When just six weeks old, Fanny developed an eye infection. A less than competent physician sought to treat the infection by placing very hot poultices on her eyelids. Although the infection did indeed clear up, the treatment left scars on her eyes, leaving her blinded for life. She was, however, still able to detect light, thus could distinguish between day and night. When she was only a year old a second major trauma befell her with the death of her father, which left her mother a widow at the age of only 21. Forced to care for four small children, three daughters and a son, Marcy Crosby hired herself out as a maid. Thus, the children were largely looked after by the grandmother, Eunice Crosby. So weep or sigh because I’m blind, I cannot — nor I won’t! To hear the word — Arithmetic! “Fanny Crosby was very small in appearance, less than five feet tall, and she weighed no more than one hundred pounds. She was said to have been a physically unattractive person — a long face, prominent front teeth with a gap between them, thick, wavy hair parted in the middle and pulled backward in curls that hung to the shoulders, and always the dark, rectangular glasses obscuring her sightless eyes. Yet, when she spoke, it is said that there was an unusual charisma about her, as her face lit up with an expression that gave her great charm and attractiveness” (Kenneth Osbeck, 101 More Hymn Stories, p. 239-240). Fanny was “known for her musical abilities as well as a talent for writing poetry. She had a fine soprano voice as well as being accomplished in playing the guitar, harp, piano, and organ. She was also well-versed in the great classics of music. She wrote some tunes for her texts but generally did not want them used, for she felt that they were too complicated for ordinary people to sing” (ibid, p. 239). To the end of her life — she lived to be 95 — Fanny would sit often at the piano and play everything from hymns to classical pieces to ragtime! After completing her studies at the Institute, she served as one of their instructors until 1858, teaching language and history. 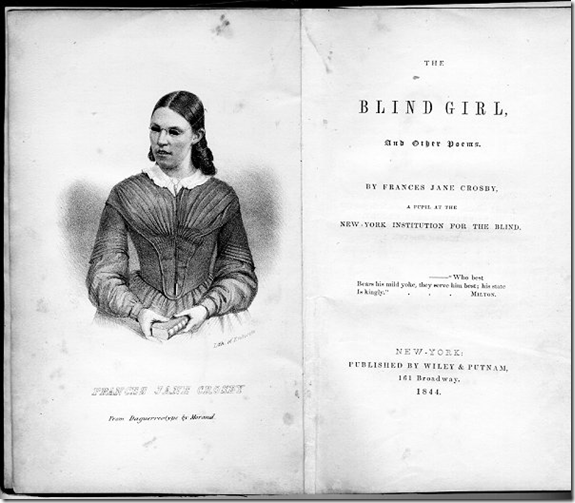 On March 5, 1858, she married Alexander van Alystyne, who was also blind, and also a teacher at the Institute. Alexander was an accomplished musician, and was well-known in New York as an organist. A child was born to them the next year, but, sadly, it died in infancy. This was a personal tragedy of which Fanny refused to speak for the remainder of her life. Her husband died in 1902 in Brooklyn, New York, where they had spent their lives together. “Though partial to the Methodist Church, Fanny Crosby was a friend of all believers who ‘loved Jesus and accepted the Scriptures.’ She frequently attended the Plymouth Congregational Church in Brooklyn to hear Henry Ward Beecher, her favorite preacher. She also liked to visit the Fifth Avenue Presbyterian Church and the Trinity Episcopal Church, especially when the dynamic Phillips Brooks was guest speaker” (Kenneth Osbeck, 101 More Hymn Stories, p. 239).